Wood paneling on the walls adds a warmth and traditional rustic element to a home, but often the color of the wood becomes restrictive when interior decorating. The warm red-brown or yellow color of most wood paneling matches with a limited number of colors and the boldness of paneled walls, especially dark wood paneling, can visually shrink the space. Wood paneling also looks dated to some, and might turn off potential buyers when you decide to sell your home. You don't have to spend a lot of time and effort completely removing your paneling to update your walls. Whitewash your walls with an inexpensive treatment to open up the space and create a clean palette for decorating. Update wood paneling with a whitewashing technique. Prepare the room for the work by covering all the floors and furniture with drop cloths. Tape off outlet covers and moldings. Sand the wood paneling. Its finished, shiny surface won't accept whitewashing, so you must sand off the varnish and stain to expose the lighter, unfinished wood beneath. Start with a rough grit paper and work your way up to the finer grits. Combine your paint with mineral spirits in your paint bucket. For every gallon of paint you put in the bucket, add a pint of mineral spirits. Test the mixture on a normally hidden section of paneling. Brush on some paint, and then wipe it away with a rag. If the result is too opaque, add more spirits to your mixture; if it's too thin, add more paint. Add your mixture to the paint tray and apply it to the paneling with a roller. Work in small sections, and allow the paint to dry for two or three minutes before wiping it off. Work from the top of the paneling to the bottom as some drips may occur. 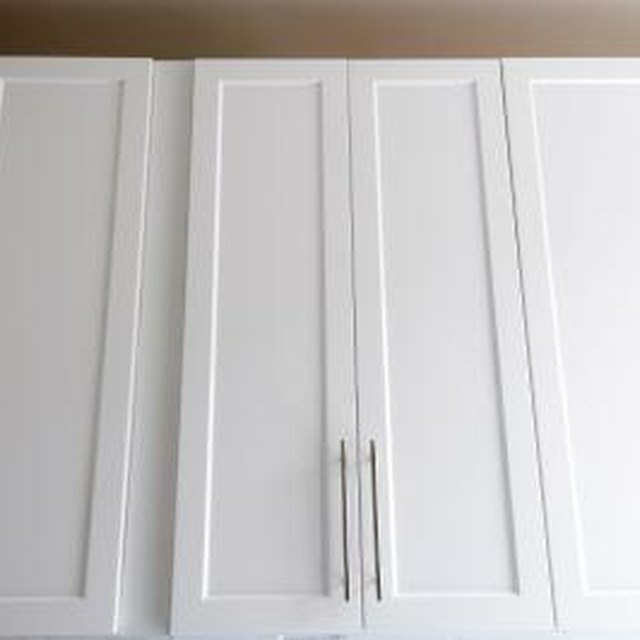 Alternative whitewash solution without paint: Combine a half-gallon of limed oak-based stain with a couple tablespoons of white titanium dioxide and stir. After mixing the two ingredients completely, add a tablespoon of aluminum powder. Apply the mixture to the walls and rub it off within 15 minutes with a rag. Seal your work with a clear finish. While these techniques are also referred to as whitewashing, other whitewashing techniques exist which are typically used for exterior surfaces such as fences or outdoor walls. These other techniques use lime and other ingredients to create a crumbly white plaster that would be inappropriate for interior surfaces. Open the windows and doors to keep the room well ventilated while you work. Avoid water-based paints for this project. They dry very quickly.